Unreal Engine 4 is a complete suite of game development tools made by game developers, for game developers. From mobile games to high-fidelity VR experiences to console blockbusters, Unreal Engine 4 gives you everything you need to start, ship, grow and stand out from the crowd. This video course shows you how to successfully set up Visual Studio for Windows so that you can begin developing games using the game engine: Unreal Engine 4. You'll also learn how C++ works and really get to grips with it. 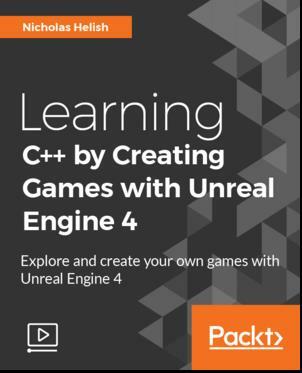 You'll learn how to start a C++ based Unreal Engine 4 project and use the editor. You will then learn how to debug Unreal Engine 4 games right within the Visual Studio IDE, before moving on to building gameplay elements that affect the player. You will use this knowledge to create a first-person shooter for the player and interactables within the environment to create gameplay elements within the world.